Full disclosure, I don’t like cooked carrots. Well, to be more accurate, I used to really hate cooked carrots and I’ve warmed up to them over the years ever since I realized what I actually don’t like are overcooked mushy carrots– bleh! They also are the kind of veggie that needs a lot of help. There’s really nothing worse in my opinion than plain steamed or boiled carrots. I actually stumbled upon this recipe after being so sick of my go-to roasted veggies. I couldn’t make roasted cauliflower AGAIN! So I just used the same seasoning but on carrots instead and, to my surprise, loved them! 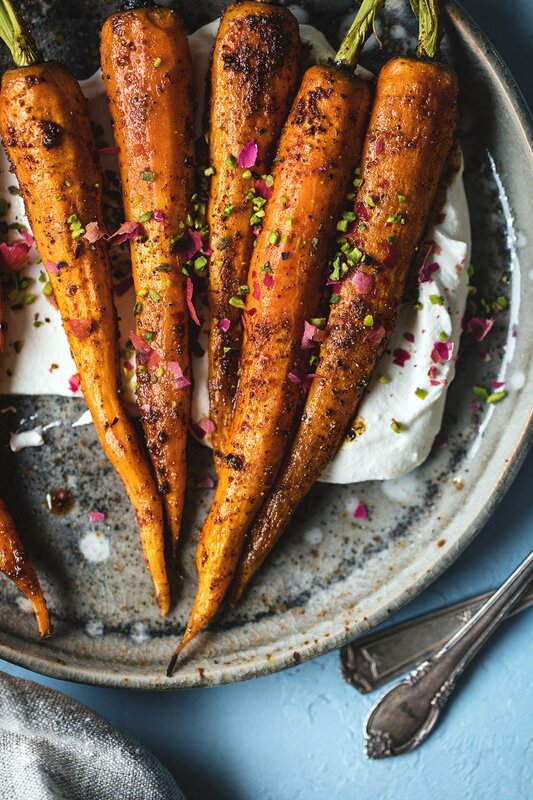 These carrots are coated in ras al hanout, which is a Moroccan spice blend. 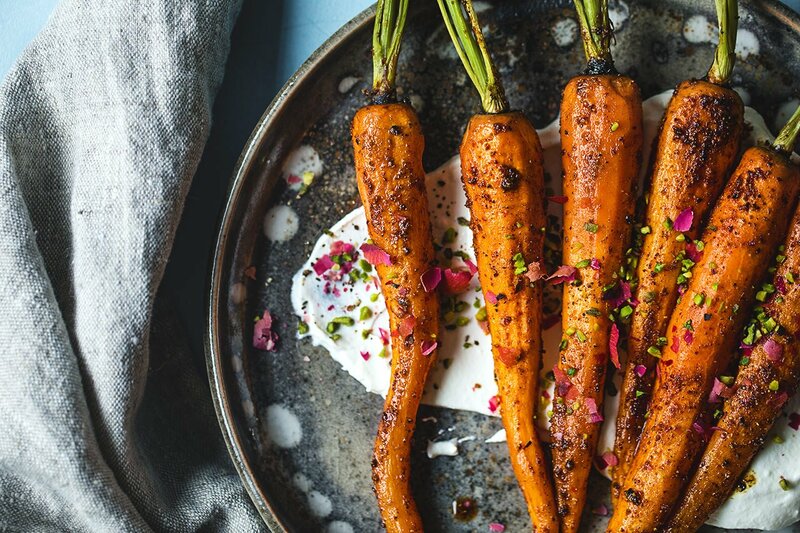 Every spice brand has their own recipe but ras al hanout typically contains cardamom, cumin, coriander, cinnamon among many other spices– the cinnamon in the ras al hanout goes really well with the sweet carrots. I’ve served mine with some creamy labneh and topped them off with some dried rose petals and pistachios. I mean how gorgeous will this look on your spring-inspired Easter table? Just saying . . .
Preheat oven to 425 degrees. Toast cumin seeds on a pan over medium high heat until they become fragrant. Crush in a mortar and pestle (doesn’t have to be a fine powder). Combine the cumin and ras al hanout with the oil, honey, salt and a few rounds of freshly ground black pepper. Whisk to combine and coat over carrots on a baking sheet. Roast for 10-15 minutes (depending on the size of your carrots this may be longer or shorter, mine were on the bigger side so if yours are small take them out sooner). 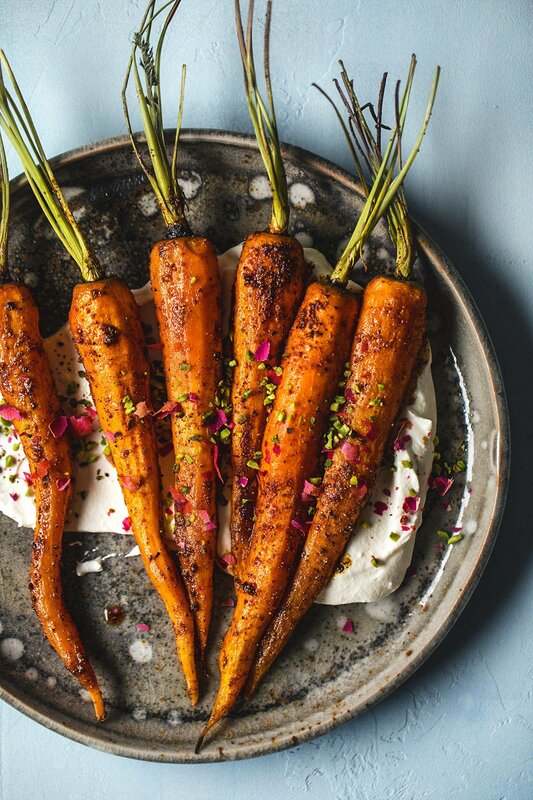 Serve carrots with labneh and crush dried rose petals and chopped pistachios over carrots. these carrots sound so intriguing! I must try this next time I roast some up! Oh my gosh, I love ras el hanout but haven’t made it in years. I love the idea of adding it to whole roasted carrots. So yummy! Thank you for the inspiration. These are gorgeous! Great minds think alike – I’m all about the roast carrots this week too. LOVE how you used labneh with yours! 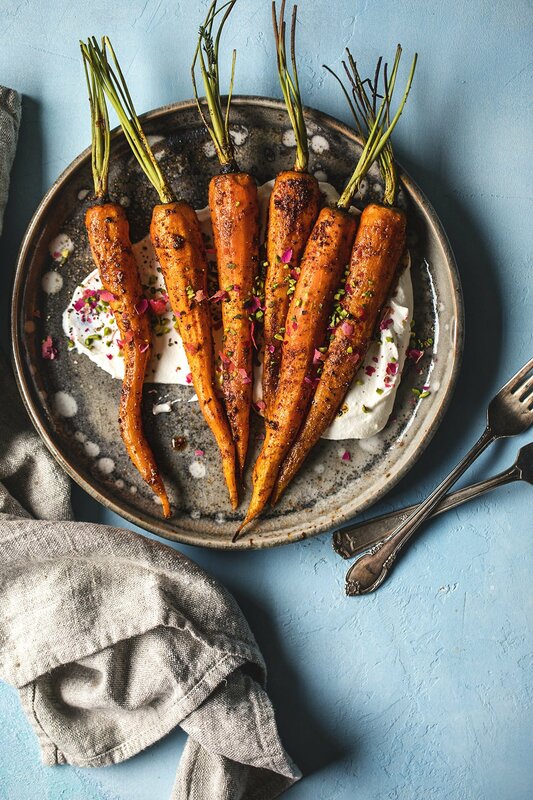 These are seriously some of the prettiest roasted carrots I’ve ever seen! It took me a long time to come around to cooked carrots as well but there is nothing better than correctly roasted and seasoned carrots. it’s so funny to me that you don’t like plain carrots!!! a good carrot can be really sweet and flavorful on its own, even when prepared simply. i promise!!! A few years ago, I was introduced to the magic that is grilled carrots. I can’t say I had strong feelings about them prior, but now I’m pretty much in love. Ohh, I’ve never had grilled carrots– gonna have to give that a try! karen, i loveeee roasted carrots and have never done ras al hanout yet. ty for upping my carrot game! Ras el hanout is hands down my favourite spice blend. I use it on everything! The carrots look delicious, thanks for the inspiration!